of paint to a pen & ink. Thankfully, the new printer allows me to print archival inks onto watercolor paper and paint on it without incurring any smudges. I like this…a lot. In fact, it’s got the wheels turning a bit. Sometimes it’s good to breath new life into an old technique. I’ll be a married woman with a house to decorate, and so much time to blog, you’ll probably get sick of updates…until then, you’ll just have to wait. 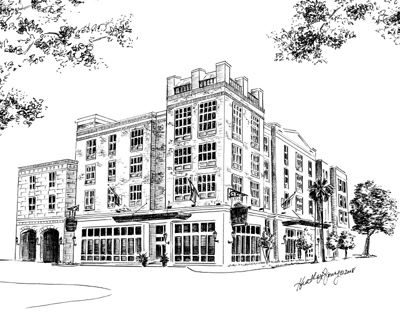 Here’s a little something I have in the works for THE best restaurant in Savannah, Alligator Soul. 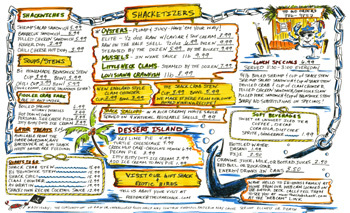 Trust me, if you haven’t been, it’s well worth your time and dollars…delish! Complete? If not, we’re close. It’s bittersweet to say the least. I mean, how often do you get to paint pirates? It’s been a great pleasure to work with the folks at the Pirate’s House again. Everyone is so friendly, and the place is rich with history, ghostly encounters, unique architecture, and of course delicious food. The photos are rusty at best, but I’m hoping to have some professional shots in the not-so-distant future. Ever heard of Anne Bonny? I hadn’t. Here’s a brief summery to give you an idea of where we went with this mural. Turns out Anne was quite the fierce pirate. She came from a well-to-do family, who owned a plantation in Charleston. She fell in love with a small time pirate, and decided the life of a pirate was far too fun to miss out on. Upon choosing a lifestyle of piracy, her family disowned her, and like many a pirate tale, rumors swirled about the nature of her being. Legend states that in retaliation, she burned the family plantation to the ground. She’s also rumored to have stabbed a servant girl to death at the age of 13. Sweet lady pirate, right? As if that wasn’t enough, she also sailed with another female pirate, Mary Read. Double the trouble, I’d imagine. Now that you have a little background (and trust me, there’s more…just google them), here’s the rough final pics. The mural is roughly 23 feet long. My cameo as Mary Read. Let’s face it, I couldn’t subject my mother to such a manly appearance. I soooo loved painting that flaming red hair! The quote below, comes from Anne’s reported last words to her husband, before he was hung for piracy. Lastly, special thanks to Cathy and Bob for giving me such a wonderful canvas to paint…(and to Buddy for getting my foot in the door) I look forward to working with you all again sometime soon. It’s likely she burned it down. Country Inn & Suites! Sorry I didn’t make it out in Savannah’s storms for your grand opening…I hope you had a great turn out, and that business will prosper. For those of you who don’t know, Country Inn & Suites has just opened on the corner of Harris and Montgomery streets in the Historic District. Every bit of attention has been paid to detail here….I highly recommend you check it out the next time you’re floating around over there. The best part…it’s right close to Noble Fare…if you haven’t checked that little dream of restaurant out yet, be sure to read their review here. Oh and special thanks to Jennifer, for your support of my work. I look forward to working with you in the future! 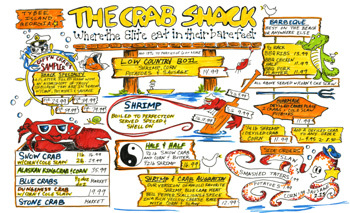 Some months ago, I was asked to bring the Crab Shack menu back to its roots. And by roots, I mean years ago a waiter scribbled out some clever illustrations, hand-lettered it, and colored it with whatever highlighters, crayons or miscellaneous drawing utensils he had in his apron. At first I was a bit hesitant, but after working out a rough draft and reviewing some of the newer (computer generated ) incarnations of the menu, I understood exactly why the owners wanted to revert back to the good old days. It got me thinking about my pre-SCAD days. I was so anti-computers, I took the minimum required amount of computer classes to earn my degree…I wanted nothing to do with them, even for things not related to art…and if I had to use them for a school project, it was like pulling teeth. While I still illustrate by hand, each piece is now scanned into the computer for edits, or simply to upload to this blog, or just for record keeping…being “connected” has become an essential part of my personal life and an integral part of my business…and it’s just amazing how a computer glitch can really turn an ordinary day upside down.